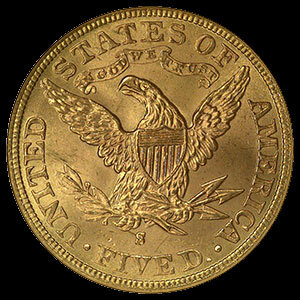 s were minted from 1839 to 1908 and are one of the most beautiful gold coins on the market. The world–famous portrait of Miss Liberty on the obverse and the American Eagle on the reverse assure that these are heirloom–quality works of art. The design for the $5, $10, and $20 Liberty Head gold coins was created by Christian Gobrecht whose design was inspired by a portrait of Venus. Millions of the $5 Liberty Head gold coins were originally minted with only a very small number having survived in uncirculated, Mint State 62 grade. 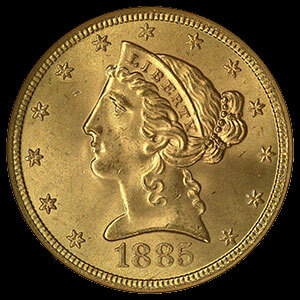 The $5 Liberty Head or “Half Eagle” was the first gold coin minted for the United States. Coins dated prior to 1900 are considerably rarer than later mintages. The $5 gold Half Eagles are .24187 troy ounces of gold and are 90% pure gold with 10% copper.